Looking for the best apple peeler corer slicer? You've come to the right place. We've examined all the different options when it comes to peeling, coring and slicing apples. Our top 8 rated picks for apple peelers, corers and/or slicers. How do these machines/devices even work? What are the different options for apple peeling/cutting/slicing machines and what do they do? In-depth information on each of our selected products. 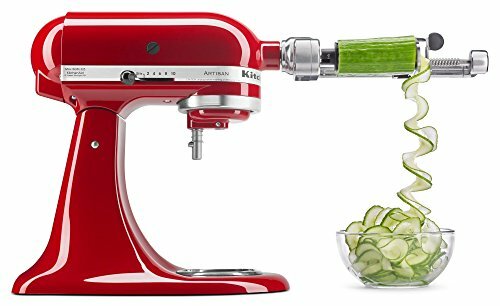 Kitchen Basics Heavy Duty Apple Peeler, Corer, and Slicer – Perfect if you need an all-in-one machine to peel, core and slice. 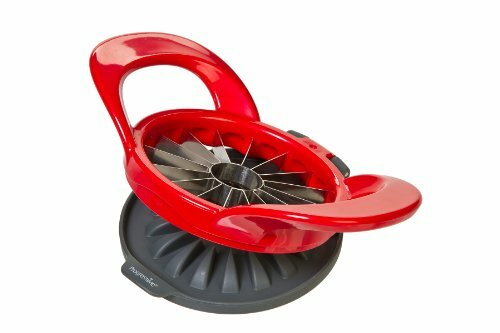 Kitchenaid Spiralizer Attachment with Peel, Core, and slice – If you have a Kitchenaid, you’ll want to get this device. 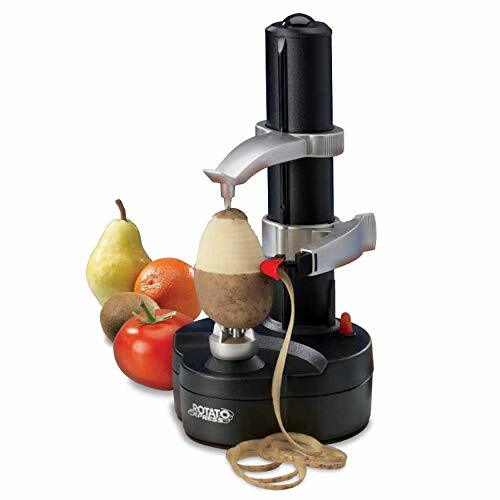 Starfrit Rotato Express Electric Peeler 93209 – A solid electric apple peeler if you just need to peel apples or other round fruits/veggies. Starfrit Pro Manual Apple Peeler – A non-electric alternative to the Rotato. 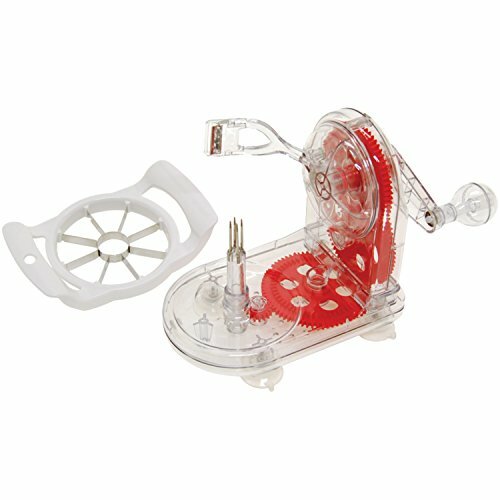 Thin Apple Slicer and Corer by Prepworks – Push down apple corer/slicer that makes thin apple slices. 8 Wedge Apple Slicer and Corer by Vremi – Another great option for coring and slicing quickly and easily. Apple Core Remover by Newness Premium – A strict corer. Gets the core out with no extra bells and whistles. OXO Good Grips Apple Corer – Solid alternative to the Newness Premium corer. What is an Apple Peeler, Corer, and Slicer? What Different Models Are Available? Removing the skin of an apple. Extracting the core of an apple. Cutting the apple into slices which are ready to eat or bake. Keep in mind that many of the devices on the market today vary in their capability. There are devices that can perform one or two of these functions while others perform all three at the same time. Before you figure out what you want to buy, it's important to understand what's actually available. As mentioned, there are many different tools to prepare an apple.​ Each of them has their pros and cons, but it comes down to trading convenience for volume. The equipment that is easy to pull out and prepare a single apple isn't going to be conducive for preparing a bunch of apples en mass. All in one apple, peeler, corers and slicers are the most powerful machines on this list. This is the type of machine to get if your household eats a lot of apples. They can also be used in an industrial setting as they are quick, efficient, and durable. So how does it work?​ The video below explains just how an apple peeler, corer, and slicer works. Mount the apple, peeler, corer, slicer to the counter-top with the appropriate mechanism. Load the apple into the teeth of the machine stem side first. Turn the handle in a circular motion and it will move the apple towards the corer, peeler, and cutter. Cutting is optional on some devices. As the apple reaches the end of the machine it will either catch the core or it will be loose enough to manually remove. Enjoy your fully prepped apple or set aside to make pie! The Pros: If you're prepping for pies or other dishes that require a lot of apples, this is the go to device. Compared to the other devices on this list, this one is going to be the quickest once its all set up. Once you get quick at it, you can probably run through 4-6 apples in a minute! The Cons: If you're going to prep one apple, having a machine like this might not be worthwhile. It would take way too much time to get it out, set it up, and go through the entire process. If you're thinking you're going to be needing one or two apples at a time, then go with an apple corer and slicer. This machine is able to work through large batches of produce with zero fuss. It is sturdy and attractive as well as being simple and easy to use. Besides apples and pears, this device is also robust enough to core, peel and slice potatoes, pineapples and large squashes. The strong metal body features high precision stainless steel blades that can also turn apples into spiral rings, which is a bonus if you have kids who you would like to encourage to eat more fruits and vegetables. This is a commercial grade gadget which is good at processing large volumes of apples. Great if you are a baker or granola bar maker. The small and compact size makes for easy storage. This apple peeler is not dishwasher safe but is easy to wash under running water. The minimal mess left behind means that it isn’t a problem rinsing it off by hand. Heavy duty -can also process squash and other large veggies. High capacity apple prepping machine! Has trouble with soft fruits and veggies. Not convenient to use for just one or two apples. The KitchenAid spiralizer works as a peeler, corer and slicer as well as a spiralizer. This makes it a great option for people who already own a standard KitchenAid stand mixer model or who are thinking of purchasing one. Rather than being attached to a hand crank, it's attached to a power hub. Because this is just an attachment rather than a stand-alone peeling and coring device, it is convenient to store thanks to its small size. 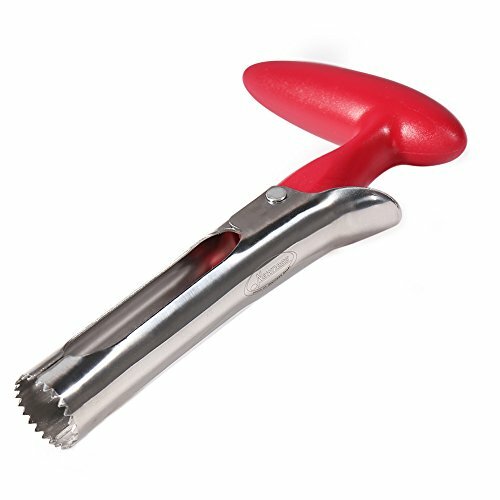 Besides apples and potatoes, this peeler is also good at peeling soft fruits and veggies like zucchinis and cucumbers, which sets it apart from other apple peelers, which are unable to handle soft fruits and veggies. Can peel, core and slice a large variety of fruits and veggies. Doubles up as a spiralizer or zoodle maker. Small, compact, and easy storage. Only works with a KitchenAid stand mixer model. Manual and electric apple peelers are typically not only designed for apples. They can also peel all kinds of fruits and vegetables such as potatoes and oranges. There's two main parts to an electric apple peeler, the holder and the peeler arm. The video below, Hey Tamona from YouTub﻿e demonstrates how one works on a potato. Load the apple into the machine, securing it on the top and the bottom. Place the peeler on the top of the apple. Press the start button, the machine will rotate and peel off the outer layer of skin. The peeler arm will adjust to hug the apple and make its way to the bottom as it rotates. You can then take the apple off and discard of the skin. Manual apple peelers work quite the same way. The only difference is that the user has to turn some sort of crank to get the item to rotate and come in contact with the peeling blade. The Pros: Apple peeling machines are great because they serve one function and do it well. If you don't mind leaving it out on your counter and eat a lot of skinned apples, it could be extremely handy for you. Once the apple is peeled, its not too hard to core it or slice it afterwards with a knife. Some of the peeling machines can also handle a wider variety of fruits and vegetables than the all-in-one machines we mentioned earlier. The Cons: The most obvious con for apple peeling machines is that they simply don't do anything else. The other problem is that they're slightly big to store if you're not going to leave it out on the counter. It's simply not worth it if you're going to peel one off items here and there. Much like the device in the video above, the Starfrit Rotato Express is the solution for easy peeling. The best part about this unit is its robustness. It's not only limited to apples. You can actually peel a wide range of fruits and vegetables including: ​mangoes, peaches, kiwis, pears, oranges, zucchinis, lemons, limes and more! Aside from the speed and convenience, the best part is that it doesn't leave behind a huge mess. The final peels will be mostly all connected and you should be able to pick them up with one hand. Can handle peeling a wide variety of fruits and vegetables. Can be used with batteries or with a power adapter. Arm adjusts quite well to cut items that are oddly shaped. Struggles with the very tops of fruits and vegetables, can create some waste. May leave a bumpy finish on the final product. If you’re looking for a device that peels your apples easily and effortlessly, the Starfrit apple peeler makes an attractive option. It comes with a spring-loaded arm that adapts to various shapes and different varieties of apples without leaving a mess in its wake. The reinforced, suction cups on the feet make it sturdy and reliable. Although it is not dishwasher safe, it can easily be cleaned with warm, soapy water and a sponge or cloth. The apple peel rarely gets stuck in the blade meaning cleanup is easy and fuss-free. This apple peeler is able to remove the skin of the apple without wasting any of the fruit and comes with a bonus slicer, which cuts apples into equal pieces. The slicer also allows you to easily remove the core from the apple once you’ve peeled it. If you’re looking to peel and core a lot of apples in one go, this gadget will get through them a lot quicker than if you were manually peeling the apples and create zero waste (apart from the skin). This gadget comes with two stainless steel blades and a spike holder, which are all extremely sharp and reliable. It even comes with plastic protectors to protect your hands when the device is not in use. Comes with 2 sharp stianless steel blades. Comes with bonus apple corer. Isn't really designed for any other fruits or vegetables besides apples. Requires manual work of turning the crank. Push-down apple corers and slicers are the tool that you're likely the most familiar with. If you want to enjoy an apple quickly and don't mind the skin, this is probably the go-to tool. As seen in the picture below, using a push-down apple corer and slicer is very simple. Place the apple on the counter with the stem facing upward. Press the push down corer/slicer on top of the apple and press down! Enjoy 8-16 freshly cut apple slices! Apple corers are used by lining up the apple with the blade and pushing down. They can be stored quite easily within a kitchen drawer and used without making a mess. The apple slices end up being the perfect size to dip into nut butter for a complete snack. The Pros: The best part about the corers and slicers is that they're easy to store and ready when you need them. If you want to enjoy some apple slices, just take it right out of the drawer, cut the apple, and chow down! Can also be used as a french fry cutter if the potato is small enough. The Cons: There's really no cons in having one of these tools around. They're inexpensive and can always come in handy. Here are our recommendations if you're looking to get a dual function apple corer and slicer. While most apple slicer and corers work the same, this unit by Prepworks had one feature that stood out from the rest: a bottom part hinged to it. You see, while most apple slicers and corers have essentially the same design, most of them don't come with anything on the bottom. With this bottom hinge, you can essentially push out all of the apple slices after you do the cutting job. It makes the process a lot easier. The Prepworks cutter makes it easier to get the apples out and makes it so that you don't have to go and pick up all the slices individually. Cuts the apple into 16 thin pieces rather than the standard 8. The bottom plate helps push everything through the device so that nothing gets stuck and clean up is easy. An extremely quick and easy way to cut and core an apple. Some people may find the apple slices to be too thin. May be harder to push down than an 8-part apple corer/slicer. The first reason was that we wanted to give people an option for thicker apple slicers in case the 16 wedge cutter from Prepworks was too large. The second reason is that because it comes equipped two other attachments, one for mangoes and one for potatoes. The standard 8-wedge cutter functions just like we've described. You simply press down on the apple and it cuts it. ​However, with a quick release mechanism, the user can take off the 8-wedge apple blades and equip it with two other options. Comes included with cutters for mangoes, potatoes, and apples! The potato blades can be used to cut all sorts of things into cubes. Works perfectly as intended as an 8-wedge apple cutter/corer. Device my struggle to cut potatoes if the potatoes are too hard. Push down apple corers are designed for one task and one task only: removing the apple core. They're a great tool if you want to eat the apple fully in tact or cut it into shapes that differ from what an automated apple slicer might produce. 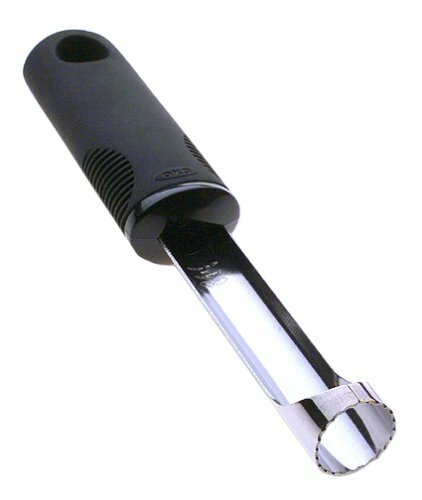 A standard apple corer couldn't be simpler to use. Demonstration of removing an apple core with an apple coring tool. Insert the apple corer into the top of the apple. Pull the corer out while twisting to remove it. Press the release device on the apple corer to drop the core into the garbage. Some tools may not have a release mechanism. If this is the case, the core will have to be manually removed from the corer. A well designed corer will have more than enough room to do so. The Pros: The standard apple corers are small and easy to use. They're so small that you can even carry them around with you! Should you find yourself in a situation where apples are being served, you'll be the go-to person to core them. The Cons:​ There are few uses in simply coring an apple. Surely you'll also want to peel it or cut it. That's why we think the corers and slicers are generally more useful. This unit made it as our top pick for standard apple corers for two reasons: its ergonomic handle and release grip. When you're coring an apple, you'll sometimes need to twist and adjust things as you're working your way through. After all, every apple is a different shape, so some intuition is involved in the process. Having the ergonomic handle gives you the proper leverage to do the twisting properly. Rather than having to turn with your entire wrist and hand, you can rest your palm out the handle and let that move around the corer for you. Ergonomic handle makes twisting and maneuvering the device easy. Release mechanism helps get the core out without breaking a sweat. You can also use it for other fruits and vegetables such as bell peppers. Stainless steel design means that its durable for the long run. Doesn't serve much of a function other than coring. While​ the ergonomic handle functions and release mechanism are nice to have, some other apple corers are so well designed that they don't actually need them. 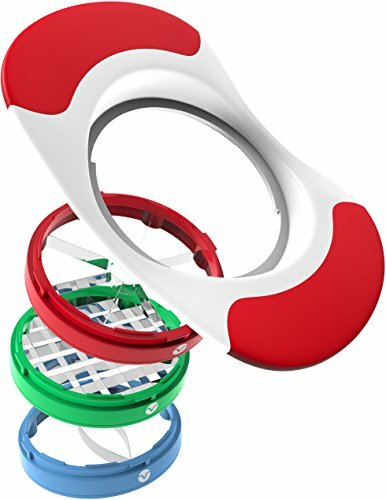 This OXO Good Grips apple corer is a good example of that, and its backed by a very reputable brand name. It also doesn't really need a release grip because the hole in the stainless steel piece is very open. This makes it very easy to get out the core without actually releasing it. Nonslip handle is designed with comfort and usability. Can easily remove cores thanks to the open-faced stainless steel. Made of durable stainless steel with a reputable brand name. Can't do much besides coring apples and a select few other fruits and vegetables. To help you make your final decision, we've created a few hypothetical categories of apple consumers. Depending on which one you fall into will help guide you to make your final choice. 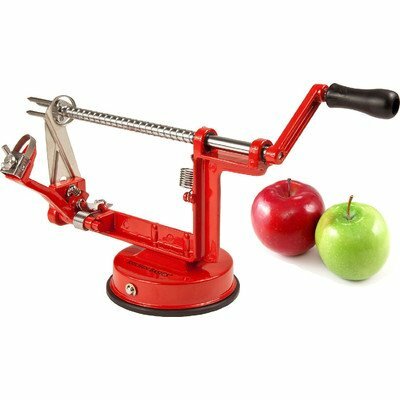 If you're the type of person that uses apples a lot of baking or cooking then you're going to want to go with an all-in-one apple peeler, corer, and slicer. If you're making a bunch of apple pies, energy bars, or even dehydrated apples it's the only device that's going to handle the high demand. If this is the case, then we highly recommend the Kitchen Basics Heavy Duty Peeler, Corer, and Slicer. If you're not going to be doing huge amounts of prep and just want to enjoy apples without the core, then go with the corer and slicer. The corer and slicer is easy to store, easy to take out, and super easy to use. Additionally, apples are so much more enjoyable when they are cut into manageable slices. If this is you, you’ll want the Vremi apple slicer and corer. If you want to eat an apple whole, but just hate the skins, then the other devices aren't going to be much use to you. Pick up the Starfrit Pro Apple Peeler and you’ll be good to go!